Why China? Why was the first one held in Qatar? Why India last year? Some has to do with sponsorship - finding innovative schools. But a lot has to do with living it. You don't have to teach ABOUT China if you can live China. Some of you will participate virtually in the conference and see the sites go up and down, the teachable moments, you'll understand it better because you were either face to face and lived it or because you were virtual and lived it. I have been living China for almost a week. Just now I'm able to get back on this blog even through my VPN. There are things I have to be wary of discussing even as I type that could cause sites to be blocked or for me to be viewed unfavorably. I am living it. My students are living it (as you can see in the photo album.) The students who went last year with me to India are comparing and contrasting India and China in many powerful ways. They live it. I'm living it to. The struggle of getting money into China. The struggle of the time zone differences with the US. The struggle of the ability to communicate with you back in the US. The tears. Yes, we have a vision, but making visions happen comes at a price. It has been at a price and continues to be. "He argues that DMAL will not evolve until a real coherence develops through collaboration and the accumulation of shared knowledge. Gee offers a concrete proposal of one way scholars in DMAL could move the area forward to a more cohesive, integrated, and collaborative enterprise: the production of what he terms "worked examples." In Gee's sense of a worked example, scholars attempting to build the new area of DMAL would publicly display their methods of valuing and thinking about a specific problem, proposing them as examples of "good work" in order to engender debate about what such work in DMAL might come to look like and what shape the area itself might take. The goal would not be for the proposed approach to become the accepted one but for it to become fodder for new work and collaboration." This conference will produce 41 worked examples of how global collaborative projects (using Digital Media and Learning) can be used to improve education. (See http://conference2011.flatclassroomproject.org) - these projects designed by students and teachers and administrators with participation from virtual participants and people from diverse backgrounds can give us some great thoughts and discussion points for how we can truly integrate global collaboration into our courses in ways that add meaning and improve learning. This is a worthy cause. We've worked very hard to get the best in the business who understand this model of action-based conferencing undergirded by meaningful actions and outcomes for the participants to come here and honestly, most of them are barely breaking even on the trip, if that. Julie and I do not pay ourselves anything. This method of conferencing is in its infancy but we believe it is an important method of professional development and hope that the conference itself becomes a working model of effective action-based professional development and learning for both students and educators. WE're excited and the conference is going to be great, but I will tell you that it has been a huge strain pulling this together... especially on Julie but also on me as well. Any support you wish to give our nonprofit is appreciated as right now we are faced with US and Chinese banks that have not handled our money transfers properly. So, please join us virtually if you wish by joining our Ning and Wiki and viewing the conference on our Taking IT Global portal. Oh, one great thing - I can now get on Twitter and Hootsuite again after beeing Tweetless for most of this week! It has been a struggle to communicate this week. (Wonder why? ;-) and yes I know why - just can't say it.) Will tell you more later -- right now I'm living it! Join us and live it to. You can be part of something that people are willing to sacrifice for to improve education. You can be part of a wonderful vision that has teachers connecting directly. Yes, we have a nonprofit, but for the most part we're just moving forward with a ton of amazing volunteers who believe it is time to stop lecturing about "action based learning" and "global collaboration" and "digital storytelling" and to do it for a change. The hypocrisy of a lecture about project based learning doesn't happen here - we're to busy working and teaching. Let the fun begin! Live the change! Hi everyone from the lovely city of Beijing in China. It is very exciting to be here with my students and my dear friend and fellow teacher from Camilla, Shealy. "Miss Shealy" and I are awake and have been since 3 am. Watching samurai movies with no English subtitles and talking about technology in the classroom as well as just the journey here. Many of my friends are sitting back home about 5:22 pm on Saturday evening - heading to the movies or dinner. Yes, I'd really like to be with my husband right now heading to a movie, just laughing and spending time together - listening to music. Even more so I wish he was here. It is funny as I travel with students I see them so upset to be away from boyfriends or girlfriends just desperate to stay in touch. Ah, teenage love! And yet, there is a lesson in this. A lesson for me in that after this trip it is time for me to be home -- really home. Not on the computer - spending time with my family and REALLY there. How many people are home in body but not in spirit-- if you spend all your time texting or on the computer are you really present? There is also a lesson in how fortunate I am to have a husband that supports me. Kip got up at 3 am on Friday morning to drive us to the Atlanta airport. He has encouraged me to go and loves and trusts me -- my husband proposed to me 18 years a go this past Monday (Valentine's Day) when I was flying to Hershey Pennsylvania. It is one of the core relationships that has defined my life... for the much better. So, this is the second lesson. Are you the kind of person in a relationship who encourages the other person to grow and do and be -- to travel and be who they are? Or do you use that power over them to dissuade them from venturing out. When you love someone and they love you - you have a tremendous amount of power. I can honestly say my husband has never once put a "guilt trip" on me but has been the most incredible, supportive man. When I came to him about this blog when I first started writing and told him I really felt I should do this- he said, "It doesn't matter what others think about blogging (at the time many frowned upon it) what matters is that you meet your calling in life and do it... if this is your calling I support you." Are you being the kind of person to encourage the others in your life? 3 - Are you able to be trusted with the trust of others? But also, third lesson here is -- are you the kind of person that the other person in your life can trust? I think one reason that Kip empowers me is that he knows that I am trustworthy. Not only am I trustworthy with where I go but also with my heart -- the heart is a funny thing -- you can be disloyal in your heart. When I travel and go, I have lots of friends but I have room for only one Kip. I will do things to inspire his trust in me including checking in and being open and up front about who I am with and where - I don't go off with men by myself - I just don't. But finally, let's extend this past just a personal, intimate relationship. 4 - Who do you help others become? We all have relationships. We all have power in those relationships. We all have relationships that aren't quite perfect at any individual moment. You an empower or discourage. You can hurt or help. Any parent of teenagers has felt the barb of their tongue as they move towards independence. It can be devastating depending upon how tightly you hold on or how much they are ready to "be set free." But when I look at my teenagers I have to know that sometimes they are just being ridiculous and that sometimes it can be the hormones talking. I said some things I regret horribly when I was a teenager -- to my parents. But I remember that my parents always affirmed and loved me so I was ready to come home. "What do my words help them become?" 'Traveling is tough and it is hard, but the journey is worth it when you enjoy your destination. You have to make a decision for yourself if you want to have the kind of job that travels like this or one where you can stay home more often. For me, I want to travel maybe once a year internationally and sort of limit my travel so I'm not gone all the time. Right now I've been gone too much and I'm pulling back for a bit, but you're right - it is a decision." OK, going to shower as we head out for learning and touring. I guess as I laid awake for the last 2-3 hours I've been thinking about the relationships in my life for truly relationships have gotten me here. How do these relationships relate to technology? Well, your face to face family should never really think that you love the computer or your "online family" more than them and if they do - examine yourself -- your presence is the only present they want sometimes and you don't have to take a plane ride to be there for your face to face family. Balance. In all things, let's act nobly -- for truly as teachers and parents we are noble when we behave nobly. Have a great Saturday night my friends in North America - Sunday awaits me here. Can a Facebook page replace the need for a website? Schools and nonprofits need to understand their place on the web and the importance of building followers on Facebook as part of their marketing/ pr strategy. Excited to have been named an Adobe K-12 Education Leader. Tips from the FTC about using public wireless networks - this is important information for students and adults to know. Calling all Math Teachers! World Math's Day - March 1st. Again another part of this International Year of Chemistry and a global water experiment. "“Chemistry—our life, our future,” is the slogan of the International Year of Chemistry (IYC), 2011. During the year, a global chemistry experiment will be performed by many thousands of school children across the world, potentially becoming the biggest chemical experiment every conducted. Under the theme, “Water: A Chemical Solution,” students will focus on modules that examine the properties of their local water and the technological solutions chemistry makes available to humanity in supplying clean drinking water. The global experiment will promote the goals of the IYC, including generating enthusiasm for science among young people around the world. Experiment modules can be carried out by children of all ages in schools across all continents because they are adaptable to the skills and interests of students, and use equipment that is widely available at little or no cost. Results will be electronically showcased as an interactive global data map at the end of 2011, demonstrating the value of international cooperation in science." I am writing to you to help raise awareness about a really cool world-wide chemistry experiment that I think students will really enjoy and hopefully help spark their interest in science. It’s a great hands-on project being sponsored by the International Year of Chemistry for all elementary school and high school students, and according to the IYC there is little to no cost to perform the experiments. They are trying to make it a World Record for largest chemistry experiment ever! 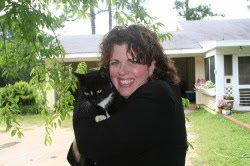 To get my message out to teachers and students I’m reaching out to sites like Cool Cat Teacher asking to submit a guest article, so if that is something you would consider I would be happy to send one along for review, just let me know! Thank you! Patrick Riccards is CEO of Exemplar Strategic Communications, wrote this on ISTE"s blog as part of their response to the state of the union address. The 2011 projects are open for application now! We have quite a few schools signed up to participate and kick off in march. This is the application form and link to information on this excellent Flat Classroom project. As part of Digiteen and Flat Classroom, we're always working to improve things. These projects are not only great opportunities for students but also as an embedded professional development opportunity for teachers - we meet, discuss, learn, and then the teacher DOES IT. As feedback from our last project, the teachers let us know they'd like a series of bootcamps separate from the teacher meetings so that the meetings can focus on the projects. So, we've put this together for them and for you if you choose to participate. It is last minute for today, but here are the upcoming bootcamps that are open to the public. Join us if you can. Also note that on Sunday at 5pm Eastern, I'll be doing a session about participating virtually in the Flat Classroom conference in Beijing in two weeks. There is online graduate school credit available (1 hour) through virtual participation in the conference and limited spaces for adults and students. Check back on this post for TBA links. Google Science fair information - this page has info on how to sign up and join. Here is the guide to going Google from Google Apps for education for both K12 and Universities. Google apps now has a marketplace for education. Aviary, Grockit, Learn Boost, engrade, Haiku LMS, EasyBib, Brainpop and Class.io as well as thinkwave are some of the first apps available in the store. best practices for using the Kindle in Library settings. We are looking for students and educators who are interested in joining us virtually for the Flat Classroom Conference 2011, to be held in less than 3 weeks time. There will be TWO online meetings in the next 2 weeks to discuss this further. Come and join us! If you have students who are interested please let us know and encourage them to sign up. The first information/ training meeting is tomorrow morning at 7am Eastern with Julie Lindsay. For a little humor, the 56 worst/best analogies of high school students. As my marketing class analyzes how our school needs to market itself on social media. From Tufts university that tweets breakfast, lunch, and dinner menus, to schools having "official bloggers (Johns Hopkins) there are many interesting ways colleges are using social media. This website looks at the pros and cons of various controversial topics. Some interesting statistics on social media. This is a great website for looking at both sides of an issue. 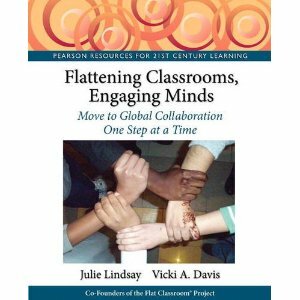 The Flat Classroom conference is partnering with Taking IT Global to bring you the Virtual Flat Classroom conference at the end of February! If you want to come, bookmark this page - RSVP and join the site! We're pysched! Elementary Flat Classroom project pilot program - this is where teachers will be reflecting as this first pilot wraps up. 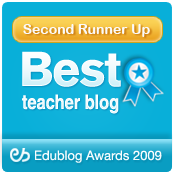 Deforestaction teacher resources and planning page. Great project.